Nicholas Collon joins Manchester Camerata for three concerts in April with an American inspired programme including the works of Stravinsky, Adams and Copland. 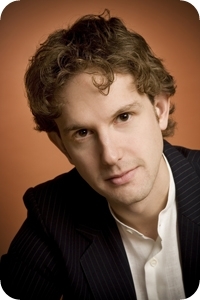 Nicholas Collon is establishing an enviable reputation as a commanding and inspirational interpreter in an exceptionally wide range of music. As Founder and Principal Conductor of Aurora Orchestra he has promoted imaginative programming that integrates challenging repertoire from the 20th and 21st centuries with masterworks of the Classical and Romantic eras. In addition to his work with his Aurora orchestra , he is increasingly in demand as a guest conductor with other ensembles in the UK and abroad. A viola player, pianist and organist by training, Nicholas studied at Clare College, Cambridge. He was awarded the 2008 Arts Foundation Fellowship for conducting, having been chosen from a list of twenty nominated British conductors.